Recombinant full length protein corresponding to Human Survivin . WB: Jurkat whole cell lysate (ab7899), HeLa whole cell lysate (ab150035). ICC: HeLa cells. IHC-P: Human ovarian carcinoma, rectal cancer and colon carcinoma tissues. Our Abpromise guarantee covers the use of ab469 in the following tested applications. ICC/IF 1/250. See Abreview by William Moore; fix with formaldehyde. WB Use a concentration of 1 µg/ml. Predicted molecular weight: 16 kDa. Found to work at 1/5000 dilution. IHC-P Use a concentration of 0.5 µg/ml. Perform heat mediated antigen retrieval via the pressure cooker method before commencing with IHC staining protocol. IP Use at an assay dependent concentration. Recommended to use at 5-7µg/ml. Component of the chromosomal passenger complex (CPC), a complex that acts as a key regulator of mitosis. The CPC complex has essential functions at the centromere in ensuring correct chromosome alignment and segregation and is required for chromatin-induced microtubule stabilization and spindle assembly. The complex with RAN plays a role in mitotic spindle formation by serving as a physical scaffold to help deliver the RAN effector molecule TPX2 to microtubules. May play a role in neoplasia. May counteract a default induction of apoptosis in G2/M phase. Inhibitor of caspase-3 and caspase-7. Isoform 2 and isoform 3 do not appear to play vital roles in mitosis. Isoform 3 shows a marked reduction in its anti-apoptotic effects when compared with the displayed wild-type isoform. Expressed only in fetal kidney and liver, and to lesser extent, lung and brain. Abundantly expressed in adenocarcinoma (lung, pancreas, colon, breast, and prostate) and in high-grade lymphomas. Also expressed in various renal cell carcinoma cell lines. Expression is cell cycle-dependent and peaks at mitosis. The BIR repeat is necessary and sufficient for HBXIP binding. Ubiquitination is required for centrosomal targeting. In vitro phosphorylation at Thr-117 by AURKB/STK12 prevents interaction with INCENP and localization to mitotic chromosomes. Cytoplasm. Nucleus. Chromosome. Chromosome > centromere. Cytoplasm > cytoskeleton > spindle. Localizes on chromosome arms and inner centromeres from prophase through metaphase and then transferring to the spindle midzone and midbody from anaphase through cytokinesis. Colocalizes with AURKB at mitotic chromosomes. Additional bands at: 37 kDa, 50 kDa. We are unsure as to the identity of these extra bands. Paraffin-embedded human rectal cancer tissue stained for Survivin using ab469 at 0.5 µg/ml in immunohistochemical analysis, using DAB with hematoxylin counterstain. HeLa (human epithelial cell line from cervix adenocarcinoma) cells stained for Survivin (green) using ab469 at 1/10 dilution in ICC/IF. An Alexa Fluor 488-conjugated Goat to rabbit IgG was used as secondary antibody (green). Actin filaments were labeled with Alexa Fluor 568 phalloidin (red). DAPI was used to stain the cell nuclei (blue). 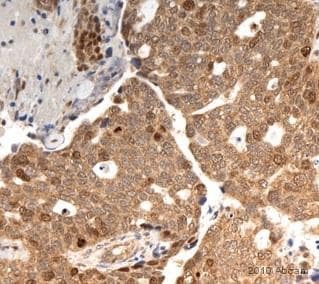 ab469 staining Survivin from Ovarian carcionoma tumour tissue sections by Immunohistochemistry (Formalin-fixed paraffin-embedded sections). Heat mediated antigen retrieval was performed (Citrate buffer pH=6, microwave oven) and the tissue was then formaldehyde fixed and blocked (Hydrogen peroxide 0.03%). An HRP conjugated goat anti-rabbit was used as the secondary antibody. HeLa cells (ab150035) in prometaphase, metaphase and anaphase stained with anti-Survivin (green), anti-tubulin (red) and DAPI (blue). These images were kindly supplied as part of the review submitted by William Moore, University of Dundee, UK. ab469 at a 1/400 dilution staining HeLa cells by Immunocytochemistry. The antibody was incubated with the cells for 1 hour and then was detected using a Texas Red conjugated Goat anti-rabbit antibody. This image is courtesy of an Abreview by Sandrine Ruchaud submitted on 30 March 2006.
ab469 immunoprecipitating Survivin from HeLa cell lysate. HeLa cells were lysed after colcemid block (ON) and immunoprecipitated with ab469 at a 1/1000 dilution. HeLa cells clear lysate (Lane 1) as well as the bound material (Lane 2) were loaded on a 15 % acrylamide gel. An HRP conjugated Donkey Anti-rabbit IgG was used as the secondary antibody. This image is courtesy of an Abreview by Sandrine Ruchaud submitted on 12 April 2006. Immunohistochemistry (Formalin/PFA-fixed paraffin-embedded sections) - Anti-Survivin antibody (ab469)This image is courtesy of an Abreview submitted by Mr. Rudolf Jung. Paraformaldehyde-fixed, paraffin-embedded human colon carcinoma tissue stained for Survivin using ab469 at 1/500 dilution in immunohistochemical analysis. Thank you for providing that extra information. It has helped greatly to understand what you have been doing and what may help to improve the signal of the staining. There are a few areas that I would suggest would be worth optimising (if you have not already done so) which may lead to an improved signal. 1. Fixation You have stated that you are fixing the tissue for a minimum of 48 hours. The ideal fixation time will depend on the size of the tissue block and type of tissue but usually 18-24 hours seems ideal for most applications. Over-fixation can lead to the epitope being masked. 2. Antigen retrieval Antigen retrieval can be used to overcome the masking mentioned for the fixation. Depending on the level of masking, different conditions of antigen retrieval may be required. For example, if using a microwave we would usually suggest trying retrieval for 5, 10, 15 and 20 minutes to see which produces the optimal results. 3. Hydrogen peroxide blocking I would suggest performing the hydrogen peroxide blocking following the incubation of the primary antibody if you have not already tried this. The hydrogen peroxide can sometimes affect sensitive epitopes and by performing the step following the incubation with the primary antibody this will not affect the staining. 4. Primary antibody incubation You mention that you have optimised this step by changing the dilution and incubation time. If you have not already done so I would suggest attempting the incubation for 1-1.5 hours at room temperature with agitation. 5. Detection method Different techniques can be used to directly amplify the signal. Currently you are using streptavidin-HRP conjugate which is labelled in a 1:1 ratio. It is possible to employ avidin which has been labelled in a 3:1 ratio with HRP using kits such as Piercenet product 32020. Although avidin can cause greater background compared to using streptavidin. Alternatively HRP polymer can be employed. This consists of using a secondary antibody which is attached to a polymer-HRP complex. Abcam has the following product to offer, ab2891, however this is a little pricey. I would suggest trying to optimise the steps 1-4 and if sufficient progress is not made contemplate employing one of signal amplification methods mentioned. We have quite a detailed guide to IHC which may be of help to you. This outlines many of the different experimental parameters which need to be considered when performing IHC and suggestions to improve experiments: https://www.abcam.com/ps/pdf/protocols/ihc_p.pdf I hope this information has been of help and your staining improves. If you want any further information or help please do not hesitate to contact us again. Thank you for contacting us. I'm glad to hear you have been getting good staining with ab469. In order to help you obtain more intense staining would you mind filling in the form which I have attached to this email. It will allow me to more fully understand the protocol which you have been performing and any areas in which it may be worthwhile to optimise. Could you also answer the following questions: 1. which HRP conjugate have you been using (streptavidin-HRP? could you tell me the catalogue no. etc) 2. in what dilution have you been using the secondary antibody? ab8114 is supplied at a concentration of 1 mg/mL. 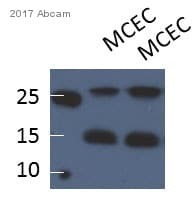 The recommended working concentration of this antibody when using it for immunohistochemistry with paraffin embedded sections is 5 µg/ml. This equates to a dilution of 1/200. This is only a guideline and may need to be optimised for the staining which you are performing. I hope this information has been of help and look forward to your reply. We are using your rabbit polyclonal anti-survivin antibody (ab469). According to the data sheet, the immunogen is "recombinant full length protein." Do you know whether this anitbody is, therefore, specific only for the Wild Type, or does it also recognize other splice variants? Thank you for contacting us. A similar question was asked by a customer in May of 2008. The question, which contains some references, and our reply, can be found under the Scientific Support tab of the online datasheet. Without testing reactivity with the splice variants, we cannot be sure which the antibody will detect. However, the splice variants listed in the UniProt database entry for the human survivin, accession O15392, (the URL is http://www.uniprot.org/uniprot/O15392) all share the same 73 N-terminal amino acids. Given that this antibody is raised against the full-length isoform 1, also know as alpha isoform, which inludes the 73-amino acid range, and assuming that the antibody recognizes at least one epitope in that range, the antibody should be capapble of recognizing all splice forms. However, depending on how the protein folds, epitopes in the N-terminal range may be inaccesible to the antibody. This should be considered a possibilty if you are trying to detect survivin in its native conformation, for instance by IHC or ELISA. The ability to make a consistent prediction of reactivity with variants is also complicated by the nature of polyclonal antibodies, insofar as the epitopes they recogize will vary with each immunization and the resulting sera. I hope this information is helpful to you. Please do not hesitate to contact us if you need any more advice or information. Thanks for your help. The membranes were blotted with the GFP Ab and then stripped and re-probed with Ab-survivin. The gel on the right is in the absence of FBS (fetal bovine serum). I didn’t try a different GFP Ab. The fact that the anti-GFP pic a 17bp band in the cells overexpressing GFP only makes me think that band is not specific. Do you recommend a better surviving Ab? Thank you the clarification. The 17 kDa band is strange, insofar as it appears in the GFP-stained blot, looks very similar to the `17 kDa band in the survivn-stained blot, and appears only in the lanes containing transfected cell lysates, which argues against it being endogenous survivin. I think you may be getting cleavage of the survivin from the GFP. That would explain the 17 kDa band in the lanes of transfected samples in the survivin blot. I am still having trouble understanding the differences among your samples. In particular, can you tell me how YFP-CON differs from YFP-SURV? I am assuming that YFP-CON is just a transfection with YFP, based on the GFP signal in those lanes. But then there is no explanation for the 17 kDa survivin signal in those lanes, in the survivin blot. For an alternative survivin antibody, I suggest ab24479, which gives clean blots on a variety of samples. Click here (or use the following: https://www.abcam.com/index.html?datasheet=24479). The Ab Lot number is ****. We use 5%milk to block the membrane and I tried boiled and not boiled samples. Please see attached ppt for the westerns done with different Abs. NT stands for not transfected. What loading buffer do you advise to enrich the monomer and get rid of the dimer. Thank you for sending the images. The blots stained with ab469 have an isolated band at 17 kDa which I assume is endogenous survivin, but that same band appears in the GFP-stained blots. Were the anti-GFP blots also stained with ab469? Also, what is the difference between the blots on the left from the ones on the right, in the ppt file you sent? What is the sample on the far right in the left-side blots? The images you send do make the problem more clear, though, than the earlier TIFF file. I do not think multimers are the problem, assuming you are adding a reducing agent in your loading buffer before boiling the sampes. What is interesteing is that the GFP antibody (if it is the only one being used to stain the upper blots) is picking up the same multiple bands as the survivin antibody, suggesting that your cells may be producing several truncated transcripts of different sizes. I cannot tell if the bands are the same size though, since the markers in the survivin blots are not labeled. Have you tried any other GFP antibodies? If you see the same pattern, then you may need to consider that possibility of multiple transcripts. I look forward to your reply, and to resolving this issue. It may require another antibody. We ordered this antibody from abcam (ab469) a while ago but I doubt it is picking a specific band. Can you please help us with a feedback from tech support about this. I tried this Ab to detect over expressed GFP-survivin and to detect endogenous survivin. I always get two bands near the right size but several other higher bands. Attached please find an image of my last blot to detect surviving in a purified cellular compartment. Thank you for contacting us about the western blot issue you are having with this antibody. We typically ask for a few details of the protocol to see if there are modifications we can suggest, but I expect you have a standard protocol that works well with other antibodies. We would also like to have the lot number of the antibody. It will be on the tube. If you do not have that, can you tell me the PO number or approximate date of the order? Some of the bands in the blot image appear to be multimers of the 16 kDa survivin monomer, along with other bands that may represent non-survivin proteins that the antibody cross-reacts with. We have not received similar reports. Can you please tell me what the samples are and how they are prepared for loading into the gel? What do you use for blocking the membrane, and is the secondary effective with other rabbit antibodies, with these samples? It is unlikely that the secondary is at fault but we ask, just in case it is a new antibody in the lab. Finally, which lanes contain the GFP-survivin, and which contain the un-transfected cell lysates? I look forward to your reply. If I cannot offer a suggestion, we will replace the antibody with a different lot or a different antibody altogether. If you prefer, we will also consider a credit or refund. I look forward to your reply.